Practice Foundry and Forging questions and answers for interviews, campus placements, online tests, aptitude tests, quizzes and competitive exams. This set of Foundry Multiple Choice Questions & Answers (MCQs) focuses on “Types of Patterns”. 1. ____________ pattern could fit entirely in the cope or in the drag. Explanation: The single piece pattern is made up of a single piece as its name suggests. One of the faces is expected to be which is used as a parting plane. Hence, it can be said that it could fit entirely in the drag. 2. The ________ pattern could have the entire assembly of runner and gates integrated in it. Explanation: The gated pattern is an improvement in the single piece pattern where the gating and the runner system are integral with the pattern. This would eliminate the hand cutting of the runners and gates and helps in improving the productivity of the molder. 3. Two piece patterns are used for manufacturing of the intricate castings. Explanation: The two piece patterns are used for large production of castings. The patterns are used for the castings where it is not possible to form the casting in one piece and where the removing of the casting without contour is difficult. 4. Dowel pins, Jigs and fixtures are all used to join which of the following patterns. Explanation: The two piece patterns are made using one single pattern cut in two halves. Once is placed in the cope and other in the drag. To facilitate the proper alignment of the of the halves in the cope and the drag, they are joined with the jigs, fixtures and dowel pins. 5. Cope and drag pattern uses separate wooden plates and alignment pins. Explanation: The cope and drag pattern are similar to a split pattern. In addition to splitting the pattern, the cope and drag halves of the pattern along with the gating and risering systems are attached separately to the metal or wooden plates along with the alignment pins. Hence, they are called to cope and drag patterns. Explanation: Gated Pattern is a pattern where the gating and runner system is integral with a pattern. A Gated Pattern consists if the molding and control patterns, jigs, the drying plates and the stripping place all embedded in it. Once the pattern is removed it is removed automatically. Explanation: The follow board pattern is adopted for those castings where there are some portions which are structurally weak and if not supported properly are likely to break under the force of ramming. 8. ________ is used to make the large castings of axi-symmetrical shapes. Explanation: The sweep pattern to sweep the complete casting by means of a pattern. These are used for generating large shapes which are axi-symmetrical or prismatic in m=nature such as bell shaped or cylindrical. This greatly reduces the cost of 3 D pattern. 9. During the preparation of cope using the follow board pattern, the follow board is not necessary. Explanation: During the preparation of the cope, no follow board is necessary because the sand which is compacted in the drag will support the fragile pattern. 10. Match plate pattern is made using wood. Explanation: The complete pattern with the match plate is entirely made up of metal, usually aluminium for its light weight and machinability. But when the dimensions are critical, the match plate may be made up of steel with necessary case hardening of the critical wear points. Sanfoundry Global Education & Learning Series – Foundry and Forging. 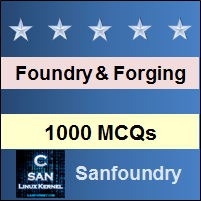 To practice all areas of Foundry and Forging, here is complete set of 1000+ Multiple Choice Questions and Answers.